Not sure how to enter in the code via the app on your phone or via the webpage? Take a look at this video on how to do it HERE! 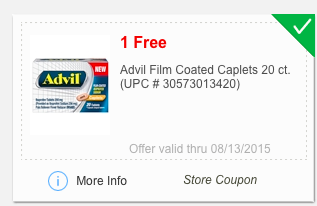 Valid on 20ct Advil, which retails for $4.19! Take note: there is a upc on the coupon.... Make sure it matches, otherwise it won't take off the coupon!!! Tag your friend's and family so they can get their FREEBIE too!!! Having Trouble finding the coupon? Make sure there is no space between "ADVIL" and "15". It has to be all one word "ADVIL15". Also make sure your phone/computer is not autocorrecting it, mine tends to do that!